AVA Prime Media & Events invites everyone to LIFE ROCKS - a concert series that aims to contribute to the continuing efforts in rebuilding the lives of our incapacitated brothers and sisters across the country. Expect the best of the Philippine music scene in their most moving, collaborative performances. 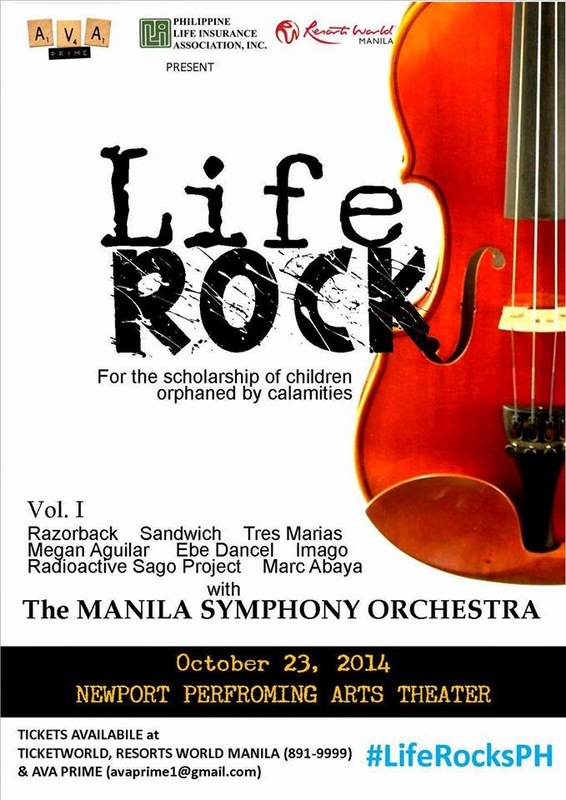 In partnership with the Philippine Life Insurance Association, the first staging of LIFE ROCKS is on October 23, 2014 at the Newport Performing Arts Theater, Resorts World Manila. The concert features amazing bands like Imago, Sandwich, Radioactive Sago Project, Tres Marias, Razorback, and solo artists like Megan Aguilar, Ebe Dancel, and Marc Abaya -- all collaborating with the Manila Symphony Orchestra; musical arrangement by Francis de Veyra, and musical direction by Diwa de Leon. Proceeds shall go to the scholarship of those who have been orphaned by calamities that ravaged the country. The selection process shall be via the institutional partnership with Museo Pambata and the scholarship program of the Manila Symphony Orchestra. A documentary will follow the stories of the beneficiaries for one year. LIFE ROCKS is the first of many events that comprises the launch and advocacy of the upcoming music lifestyle show - THE LINEUP - which begins airing November 2014. The producers will make a formal reveal on which network it will air in the coming weeks. THE LINEUP is an original AVA Prime creation.